1999-00 UD COOL AIR MICHAEL JORDAN #MJ6 LEVEL 1 DIE-CUT /100 PSA 10 POP 3 RARE!! whic0006 has no other items for sale. Details about 1999-00 UD COOL AIR MICHAEL JORDAN #MJ6 LEVEL 1 DIE-CUT /100 PSA 10 POP 3 RARE!! 1995 95-96 SP NBA All-Stars Die-Cut Michael Jordan #AS2, All-Star Team Insert! 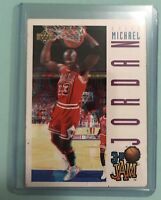 1993 UPPER DECK PRO-VIEW 3D #91 MICHAEL JORDAN "3D JAM" RARE!